Continued from Teenage Mutant Ninja Turtles #10. 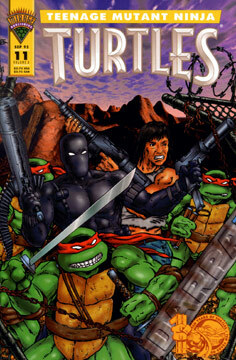 Braunze makes plans with the TMNT, Casey and Nobody on how to enter D.A.R.P.A.’s fortress. Braunze implants a powerful mental suggestion into Casey’s mind – causing Jones to think of himself as a Schwarzenegger-like action hero who has no fear. Much to everyone’s dismay, Casey even begins speaking with an Arnold accent, something even Braunze hadn’t expected to happen. Surprisingly, Braunze’s plan works perfectly, as Casey takes the initiaitve to grab a large gun and dive off the cliff onto a passing D.A.R.P.A. troop carrier. Jones’ attack causes the driver to crash, and our heroes now have the means to breach the facility. Unfortunately it becmes quickly evident that they won’t be able to covertly enter D.A.R.P.A. as two helicopters close in and begin firing on the team of rescuers. Undaunted by this development, Casey puts the pedal to the metal and literally crashes through the front gate of the base. Explosions and gunfire fill the air, as our heroes break their way deeper into the facility. Soon enough the guys discover the room that has the tubes filled with captured aliens. Braunze recognizes one of the creatures to be an old friend and frees him, just as a Triceraton escapes from his own chamber. An uneasy alliance is formed, and one more alien is unlocked from its prison and joins the fight for freedom. Unfortunately Raphael isn’t among the prisoners in this room, so the search for him continues. The unlikely group of allies go in search for weapons and find a room filled with alien technology. The Triceraton takes his opportunity to seize his sub-space homing beacon – but much to his surprise, before he can utilize the device, he finds that it’s already been activated!